After a false but rampant rumor Friday afternoon that the government troops were about to make a move on the protesters at Ratchaprasong intersection, the troops finally moved at 2:00 Saturday afternoon. They are simultaneously taking back the protesters’ base camp along Ratchadamnoen Road in the old city as well as the streets mentioned in my previous entry around Central World Plaza and Siam Paragon. After the government specified the eight levels of engagement they would use in Friday’s newspapers, ranging from “show of force” to “tear gas” to “rubber bullets,” everyone was certain the clearing out would happen on Friday afternoon. The protesters, though, acted first and caused the government to lose face. First, they successfully overpowered soldiers protecting the Thaicomm cable TV station, the one that had been broadcasting the UDD’s “People TV” until the government forced them to stop. In the process, the protesters obtained a significant cache of weapons and ammunition. There were suggestions afterwards in the media that the army was having a problem with “watermelons” – soldiers who were Red Shirts at heart but dressed in camoflage. 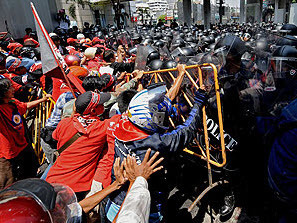 In the second affront to the government, protesters converged on the police headquarters to prevent the police from deploying riot gear and officers. At the front of the Red Shirts’ crowd was a row of monks, many of whom are from the north and support the UDD’s efforts. (I’ll save my commentary about the appropriateness of their involvement for another time.) The Red Shirts figured the police would not attack the monks so it seems they were planning on using them as holy shields to gain entrance to the police compound. In response, the police put a line of policewomen at the front of their ranks. This may seem puzzling at first but one of the key tenets of Buddhism is that monks may not touch or be touched by women. (A very serious matter within the conditions of being a monk.) So the police figured that putting women at the front of their ranks would prevent the monks and the crowd of Red Shirts behind them from advancing. It seemed to work. It is now after 4 in the afternoon. The Skytrain is closed (to enable rapid troop movement if the streets are blocked) as are all businesses in the central business district. Hotels in the area probably locked down. For a second consecutive day my evening plans have been thwarted. This last sentence is shocking. The Privy Council is the group that directly advises the throne. I’m amazed that the Post would suggest that this group might have any direct involvement in the political activites as they are supposed to be above politics. After the September 2006 coup there were similar suggestions bandied about and many threats against those who made them. This entry was posted in Uncategorized and tagged politics, Protests, Red Shirts, Thailand by christao408. Bookmark the permalink. Highly volatile situation eh? You stay inside and be safe… also, keep us posted on the new developments. @Dezinerdreams – Yeah, our plans to go out this morning, which were interrupted yesterday by rumors, are now interrupted by reality. Drat. What country is this? And what are they protesting? ^^^ wow…Anyways, is the Privy Council corrupt?I like the monk vs. female police thing ha. The political weather seems very stormy. Hope you can stay safely away. With that going on outside, I bet you will have plenty of time to experiment with panini recipes. Uh-oh, I wonder how’s the Grand Hyatt Erawan is doing. The rooms have a great view of the action down at the hot spot. Is Tawn able to go to his work place? @yang1815 – As someone who desires to live in Thailand, I’ll choose not to answer that question. @CurryPuffy – Tawn’s work is one stop before the closure area. The Erawan is in lock-down right now but the view is priceless. @murisopsis – @stevew918 – Going to do the safest thing and head to Macau and Hong Kong tomorrow! @jenessa1889 – Thailand. My previous entry provides more detail. Stay safe, Chris! Those photos are spectacular, and look like something out of a history book! @stevew918 – Don’t think we’ll be gambling but thanks for the thought! @slmret – The photojournalists here have captured some amazing images. Sadly, one of them, a 43-year old Japanese working for Thomson-Reuters, paid for his work with his life last night, getting shot in the chest during the clash between protesters and the army. What a big mess! Please stay safe! I’m glad that you’re getting out of there. Eek! I am surprised and somewhat miffed that the govt would put women officers in the front line. Granted that the monks wouldn’t touch them, but what would happen if someone else, ( not a monk ), had to throw stones or shoot at these women. It is a weak govt if it sends women to be in the fore front I think!Be safe Chris. The pictures are so amazing in the portrayal of the passion of the people.